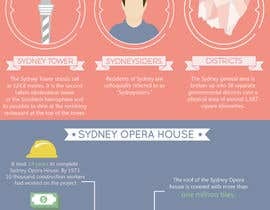 I need someone who can design an infographic for our travel website based on the top 75 facts about Sydney (Australia). I have attached the first 30 - winning design will need to finish based on the 75 that will be provided. Please look to include relevant graphics/icons - eg. opera house, harbour bridge etc. Looking for something that is fun, relevant and engaging. Please highlight / bold and numbers to stand out. Winner may also be chosen for more ongoing infographic projects. thanks for your all your designs so far -they look great! 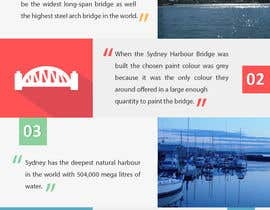 A general comment would be to try and layout the facts in an engaging way - highlighting numbers or key details with images, icons or borders could help achieve that. working on it will upload entry soon..
thanks, gonna submit my work soon! entry #4 uploaded. thank , k.
you want full sentence to appear in the infographic? what dimension you want, ? thanks - our website is AirfaresFlights.com.au - it is predominately a red colour. We will look to seal and guarantee once we have a few designs that meet the brief to review. In regards to the prize, we may have a few more infographic jobs for the winner which could use a similar template to the winning design (therefore should be less work to complete as an ongoing job).